Interview: Actress tried to imagine herself in ancient Greece of Aeschylus’ “Agamemnon,” on Court Theatre stage through Dec. 6. What would she, this modern woman, have done in the place of a legendary queen who has been abandoned by her warring husband, a man who also has sacrificed their daughter for the sake of his military campaign? 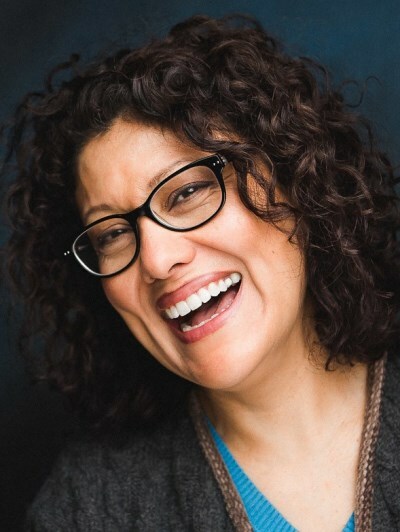 That was the question on Sandra Marquez’s mind as she approached her complex portrayal of the vengeful Clytemnestra in Aeschylus’ “Agamemnon” at Court Theatre. “In that time period, Clytemnestra would have been an amazing woman,” says Marquez, who also played Agamemnon’s wife in Euripides’ “Iphigenia in Aulis” last season at Court. “She is more public in ‘Agamemnon’ than in ‘Iphigenia,’ and every night I hear the Chorus’ expressions of doubt about why they (the citizens of Argos) should trust a woman. People, as Marquez likes to say, have their ideas about Clytemnestra, who in the king’s long absence has taken a lover, Aegisthus (Michael Pogue), and now with his help plans to assassinate Agamemnon (Mark L. Montgomery) upon his return – his victorious return — from the Trojan War. Is she a horrible woman, an unfaithful and murderous schemer, or a neglected, misused spouse whom the great king holds in rather low esteem? 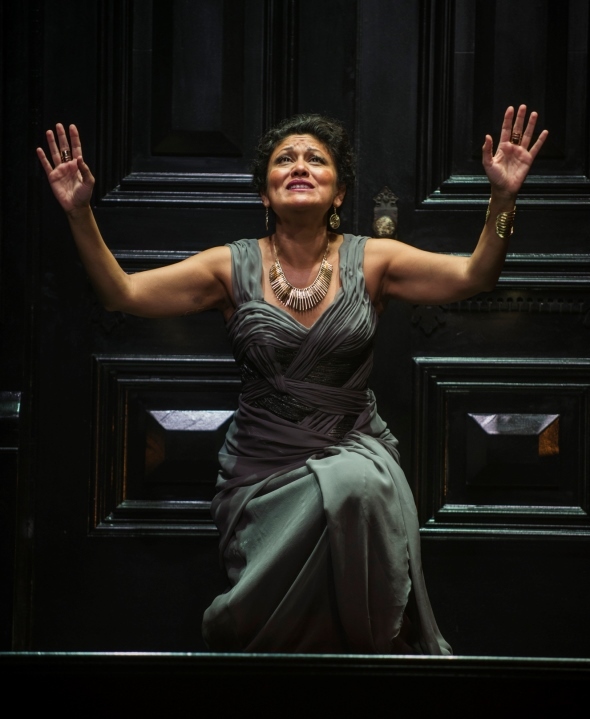 Marquez says her own perspective on Clytemnestra was sharpened by the scholarly insights of Nicholas Rudall, professor emeritus of classical studies at the University of Chicago and founding artistic director of Court Theatre. 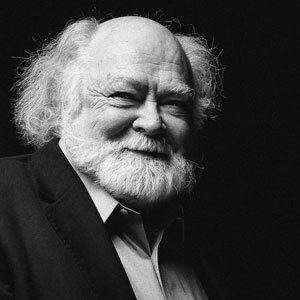 Rudall’s new translations are the basis of Court’s three-year Greek trilogy that concludes next season with Sophocles’ “Electra.” All three plays are directed by Court’s current artistic director, Charles Newell. “It was great to have Nick in the room, and to listen to him talk about how things really were in ancient Greece,” says Marquez. “During ‘Iphigenia,’ I thought, ‘Oh, God, I just want to follow him around wherever he goes. He taught us so much about that period. What Clytemnestra is bent on avenging is Agamemnon’s sacrifice of their daughter Iphigenia prior to the war. Agamemnon was commander-in-chief of all the Greek forces bound for Troy to retrieve Helen, stolen from the marriage bed of Agamemnon’s brother Menelaus, king of Sparta. But when the angry goddess Artemis withholds the wind from the Greek fleet at Aulis, Agamemnon’s priests inform him that only the sacrifice of his own daughter will assuage the goddess’ fury and allow the vast, impatient army to continue on its way to Troy. This queen with blood on her mind is also a daunting character to observe, and Marquez notes that her dress designed by Jacqueline Firkins accents Clytemnestra’s menacing power. In short, says Marquez, Clytemnestra is “bigger than life and an angry woman.” But she’s also complicated, and it was in getting at the psychological nuances that the actress says she especially profited from the experienced directorial wisdom of Charles Newell. 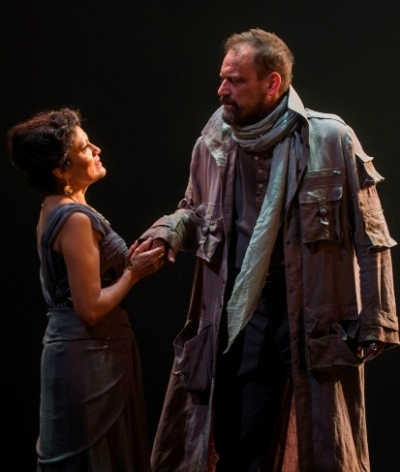 “Agamemnon reveals Cassandra (Adrienne Walker), this woman he has brought back from Troy. He calls her a flower the Greek army has plucked for him. He says to me, his wife, ‘Be good to her.’ It’s so humiliating – in front of the chorus (the citizens).